Chicken Dhansak is a high-in protein Parsi dish. The chicken is cooked with lentils and spices and it is best served with Brown Rice and salad. Wash the chicken and cut it into equal pieces. Let it marinate in the mixture of salt, ginger and garlic paste for overnight. Wash tuar dal and put it in a pressure cooker. Also add onions, potato chunks, tomato, mint leaves, coriander leaves and water in the cooker. Cook it for 6 to 7 minutes, and then turn off the flame. Meanwhile, boil the chicken pieces in a separate pan until they turn tender. Blend the mixture of cooked vegetables and dal until fine. Add more water, if necessary. It should be of custard like consistency. 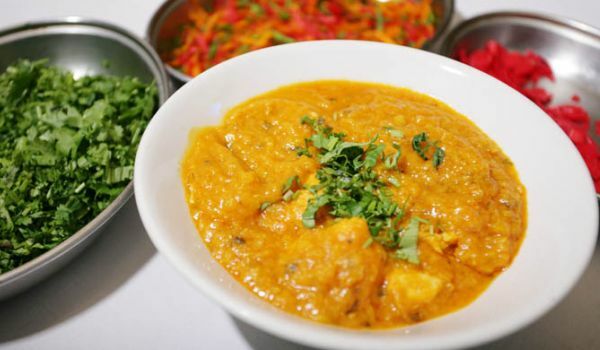 In a serving bowl, place the drained chicken pieces and pour the mixture of dal and vegetables over them. For tarka, heat oil in a pan and put garlic into it. Let it fry for a minute or two. Pour this over the above-made dhansak. Chicken Dhansak is ready. Serve it with boiled rice.